It was a very calm night and nice and sunny when we get up at 0730. Michael took Kelly and Veto to shore. Kelly went to do some more laundry and shopping. Michael then went back to the public wharf in the marina and walked with Veto to the chandlery. He bought winch grease, hydraulic oil for the autopilot and a few other things. When he got back to Catlypso, he collected Steve and Sue and took them to the Whisper Bay wharf. Here they got off and when Ron and Donna arrived, he took Donna and their gear back to the boat while Ron took his car and camper trailer to secure parking. Steve followed and later brought Ron back to the ramp. Michael later collected Ron and Kelly from the wharf. Once everything was packed away, we set off at 1120. We had the genoa out but we had to motor as well as the wind was almost on the nose. We did anywhere from 4 to 6 knots into a 1.5 knot current in 10 to 24 knots of wind. We had to pull the sail in just before Pioneer Point but once around we could put it back out. We had up to 3 knots of tide against us and the angle of drift was about 10 degrees. We had to motor the last section to Unsafe Passage. From here we again motorsailed. It was quite choppy in the middle of Whitsunday Passage as there was a 3 knot current and 18 to 22 knots of wind. We made 4 to 5 knots motorsailing. 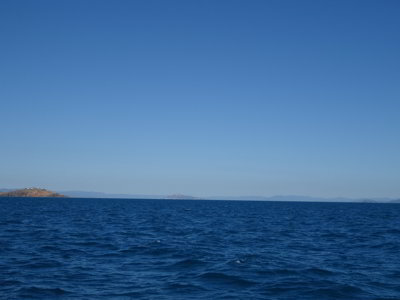 We pulled the sail in as we neared Cid Island as we lost the wind and also had to turn right into it. 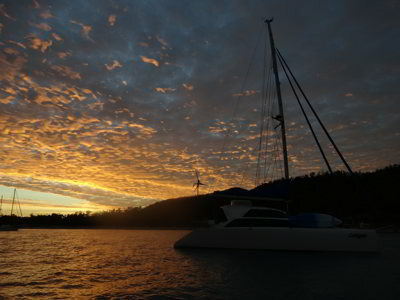 We anchored off Sawmill Beach in Cid Harbour at 1500. It was beautiful here, flat water and mostly protected from the winds. We had made 45 litres of water on the latter part of the sail and Michael put 70 litres into the water tank. 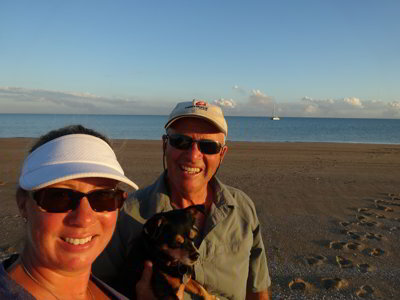 Michael later took Ron and Donna to the beach and they walked to Dugong Beach and back. We then had showers, sundowners and then Kelly cooked salmon for all but Michael who had some fancy sausages. We had a nice salad with this. Tonight the gas ran out, this means it lasted four weeks, not bad considering we had 3 to 5 people on board during this time. There were lots of shooting stars tonight. We went to bed at 2200. Today is Veto’s 9th birthday! She is our baby and only child, so we have a special day planned for her. We get up at 0710 and have a beautiful sunny morning. 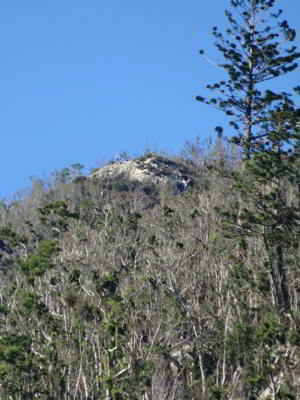 After breakfast, Michael takes Ron and Donna to the beach so they can do the walk to Whitsunday Peak, the 437 metre high mountain on the island. We did this a few weeks ago, so we will not go. While they are away, Michael cleans the watermaker filters which are dirty from all the sand and silt floating in the water because of the extra high and low tides at the moment. He then puts the watermaker on to top up our tanks. 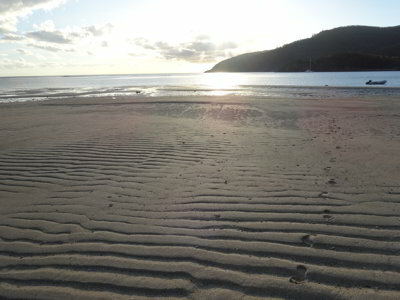 We then went to the beach to the south of Sawmill Bay for a swim, it is cleaner and deeper here. Madiba came in and anchored next to us. Edward, Louisa, Imogen and Chloe only have a couple of days left on board after sailing here from Hobart. 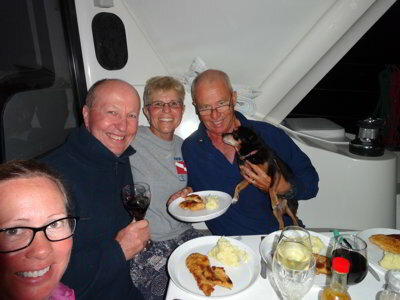 Edward’s parents, Roy and Jane, are now on board and will eventually sail her back to Tasmania. We later go over in Thunderbird 2 to saw goodbye and also say hello to Roy and Jane. 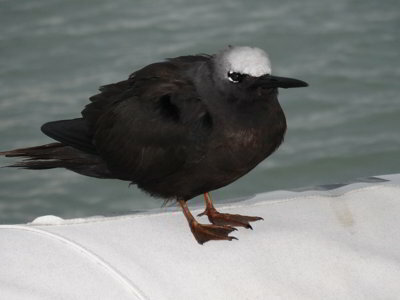 We have been seeing them now on and off since about 25 May at Great Keppel Island. Ron and Donna come back just before noon and at 1250 we head off. We motor out and then put out the screecher. The wind is quite variable, one moment being under 10 knots and then over 25 knots. Soon after we got sailing, the wind changed direction so we had to pull in the sail. However, we made a mistake and furled it the wrong way. This happened because when we had the new furling line put on, it was put on with the rope running through the rear pulley the opposite of before. Then, because of this, the sail flapped a lot and then the port sheet came free from the sail. This is attached by a clip which has a lock on it and it should not be able to do this. This also happened a few weeks back. 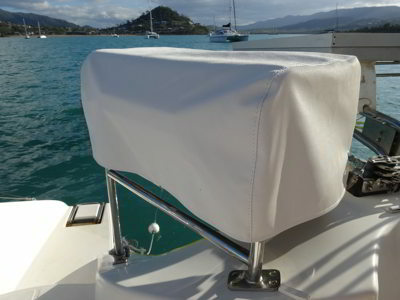 Once this sheet came free, the sail flapped more and then ran out due to the furler being done the wrong way. Then the starboard sheet came free. What the!!! The whole sail is now flapping wildly around and when Kelly tries to drop it, it is hanging out the side over the water. We turn into the wind so that the sail is now over the deck and she drops it, with Ron assisting to hold it down. Donna then pulls it in through the hatch inside. Kelly then uses some rope to secure it. 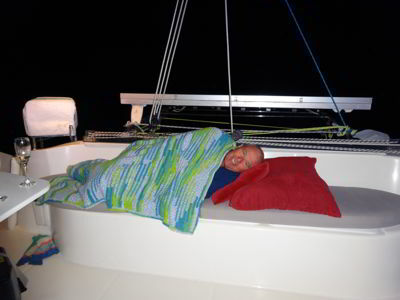 We have ordered new sheets for the screecher which will be attached to the sail differently. We have no idea why these clips are coming free. Once again, we reacted well overall and we suffered no damage other than some bruising to Kelly. We then motored the rest of the way to Nara Inlet. At 1430 we anchored in Refuge Bay near where we have done before. There are other boats here, we end up with six in total. We have lunch and then Kelly tidies up the screecher on the foredeck. Michael makes some muffins which will be used as a birthday cake for Veto later. It is too windy to take Ron and Donna in the dinghy to the Aboriginal art site, so we just read our books and magazines. After showers, we have sundowners and then Kelly makes chicken schnitzel and mashed potato for dinner. Veto gets her own small schnitzels and mash! 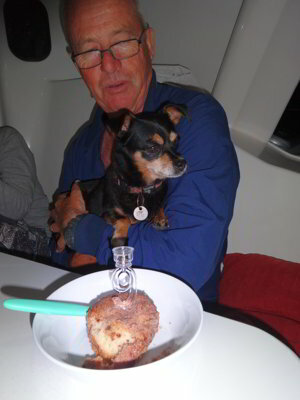 We then have the muffins and sing happy birthday to her! We do love her as you can see. We see some satellites and shooting stars before we go to bed at 2100. We had a very calm night again, despite the wind which at times hits about 20 knots. We get up at 0800 and it is still too windy to take the dinghy to the art site, so we decide we will try to get back here later in the week as the forecast at the moment is for strongish southerly winds right through to the weekend. We have breakfast and at 0950 we motor out of Refuge Bay and Nara Inlet. It is very windy, over 15 knots at times. We motor till we round the south-western corner of Hook Island and then put out the genoa. Despite the strong wind, we are only making 4 knots even with an engine on as we have over three knots of current against us (and sometimes four knots). As we pass Stonehaven, we pull the genoa in as the wind is all over the place. We motor the rest of the way through The Narrows and into Butterfly Bay. There are only four boats here and we snare the southern-most mooring which is the most protected. We are on the mooring by 1140, shortening it as we normally do. The water is calm here, but we have under 10 knots but with over 25 knot bullets every few minutes. After lunch Ron goes for a snorkel while the rest of us relax and read books and magazines. It later gets very cloudy and we have a few spits of rain. The weather today is much worse than the forecast. Most of us have showers and then we have sundowners. It is cook outside, so we all have long-sleeve shirts or jumpers on, as we have been doing a lot in the past week or so. Dinner is steak, sausages and salad. We go to bed at 2100. Today is Kelly's birthday! Due to the not great forecast, we have decided to stay in this area today rather than head south towards Whitehaven Beach. We had a very calm night with little wind and the only time we woke was when the anchor alarm went off as we turned under influence of the changing tide. We get up at 0710 and while Michael goes to the beach for a walk, Donna makes Kelly a coffee to have in bed. It is too windy to fix the screecher, so after breakfast, we plan to up anchor but we head on the charter boat skeds the boat next to to us (Seaclusion) ask the charter company about a doctor as one of their passengers has been stung by jellyfish. We radio them and say we have lots of stuff to combat stings. They come over. The woman is from California and is with her husband and kids and an Australian friend. We pull out all the things we have. To be honest, the problem is that she has scratched the welts and they are probably a bit infected now, four days after she was stung. We give her a tube of Savlon which we have found to be the best thing to stop itchiness and also kill any germs. She also discovers that her friend has some antibiotics which she could take. After this we fix the screecher as the wind has dropped. We pull it up, then extend it and roll it back away. We then leave at 1005 and motor to Maureens Cove which is only 1.4 miles away. We moor there at 1025. Ron and Michael went for a snorkel and Kelly went to the beach for a swim. Ron and Michael saw butterflyfish, parrotfish and brain coral, but all the soft corals and sponges are gone. 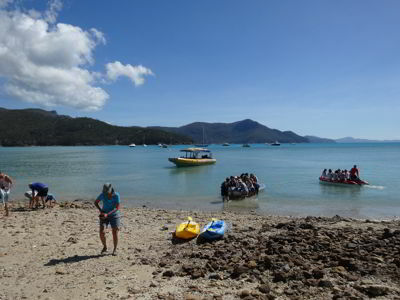 At 1155 we leave and motor back to Butterfly Bay, arriving there at 1215. There is only one other boat here now. We have lunch and at 1510 we all go to the beach. When we get back to the boat, some of us have a swim and we all have showers. Michael also puts the missing bolt back in the toilet seat (Ron brought it from Sydney) and attempts to unbolt the fuller pulley but discovers the bolts have nuts in the engine room, so he needs a second person to help. This can wait. Later True Companions comes in, we met them in 2015. We then have sundowners and a great dinner that Kelly cooked for her own birthday, roast pork rack and vegies and then sticky date pudding and butterscotch sauce with ice cream. We wash this down with Australian sparkling (Chandon) and then French champagne (Moet and Chandon). It was a little bit rolly last night and we had a fair bit of mooring knock. Otherwise it was fairly calm with not too much wind. It is sunny with some cloud when we get up at 0710. After breakfast, Michael and Kelly went over to True Companions and speak to Michael and Karen. We discover that they sailed up here last year as well. We have a nice chat and hope to catch up with them again somewhere else on this trip. At 0905 we motor out and encounter quite strong winds, much more than the forecast of 10 to 15 knots. At the Narrows we pull out the genoa but by the time we get to the southern end of Stonehaven we have to pull it in as the wind is all over the place. We then get into very rough water, with a three knot current behind us and 20 plus knots of wind on our nose. We have one wave come right over the bow and through the open clear at the helm, splashing Michael and everything else. To make matters worse, the chart plotter is mucking up. This morning Michael noticed that it was not showing the track, so he turned this on (it is always on) and then it froze. After this it continually freezes and then reboots itself, each time going to the new startup procedure. We have also lost all our waypoints, tracks and routes (apart from perhaps 5%). Damn. At least each time it starts, the chart plotter works for a short time. 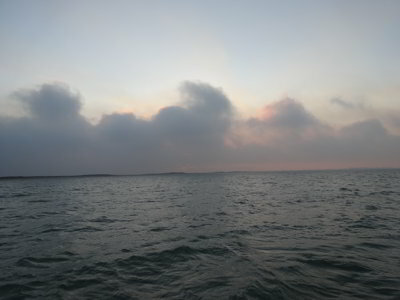 Once we round the south-western point of Hook Island we are out of the current and it is much calmer. However, the chart plotter is now not showing anything when it reboots. Even turning the power on and off at the breaker switch does not help. We motor into Nara Inlet and go right to the northern end and anchor at 1115. Kelly takes Ron and Donna to the Aboriginal art site while Michael looks some more at the chart plotter. Well, the chart plotter seems to be totally stuffed. Nothing he does makes it work. We leave at 1215 and at 1240 we anchor in Refuge Bay at the same spot as our last time here. We have lunch and then Michael pulls the chart plotter out and tries some more things unsuccessfully. Meanwhile Kelly replaces some broken clips on our trampolines. Michael later added 44 litres of diesel to the fuel tank and 44 litres of water to the forward starboard tank. 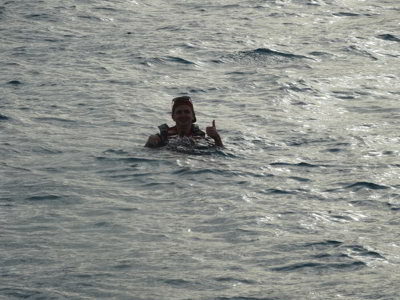 At about 1520 Michael and Ron went for a snorkel in the main part of Nara, just north of where we are anchored. 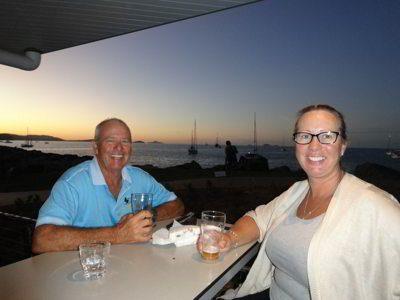 They have a nice time, the hard and soft coral and sponges here is the best we have seen in the Whitsundays. There is also some nice fish, including anemones and Clarkes anemonefish (clownfish). When we get back, everyone has showers. We then have sundowners and chilli peanut beef and noodles. It is very quiet here tonight, we are the only boat in Refuge Bay (six last time) and only four in the main inlet (probably 20 last time). It gets calmer and the wind is now under 10 knots. 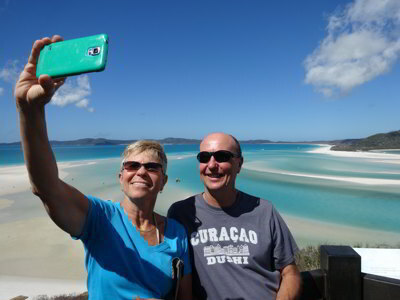 Hopefully tomorrow will be calmer so we can get to Whitehaven Beach. 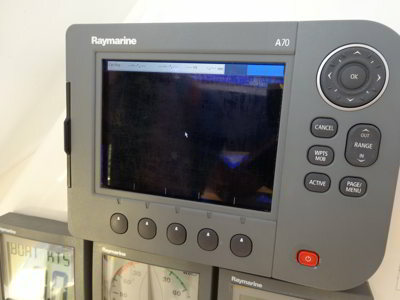 Later we researched new chart plotter and probably will get a Raymarine A9 or E7. It was a very calm night and Michael saw four shooting stars and one satellite in a few minutes when he got up for a pee at 0440. After breakfast, we head off. It is sunny and not too windy, perhaps 12 knots. We head past Macona Inlet and into Hook Passage and then south to Tongue Bay. On the way we heard that a charter yacht Wasabe lost their dinghy overnight while moored at Cataran Bay. We tell the charter operator we will keep a look out as we pass that area in case the tide was stronger than the wind and it headed west or south. 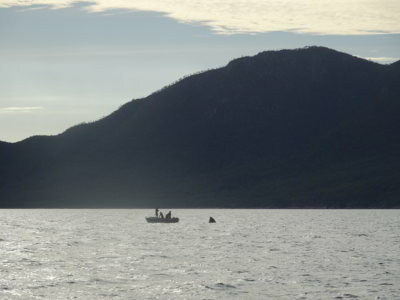 We later hear that a tourist boat found the dinghy about four miles north-west of Cataran Bay. Very lucky couple on Wasabe who will not be slugged for the cost of the dinghy (or at least the insurance excess). 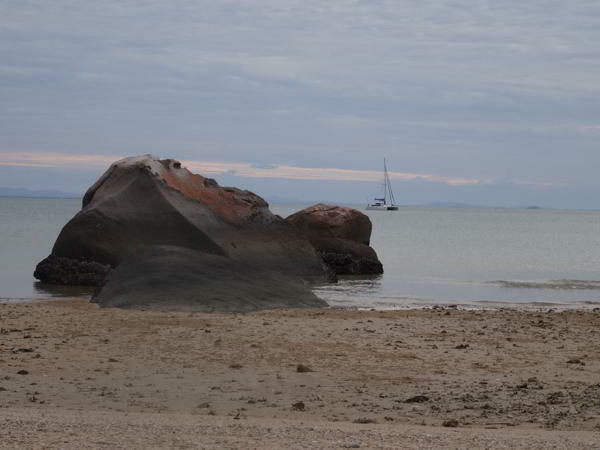 We get a mooring at 1115 and after a cuppa, Kelly takes us into the beach and Ron, Donna and Michael walk to the Hill Inlet/Whitehaven lookout. There are lots of tourists here and more arrive as high tide approaches. 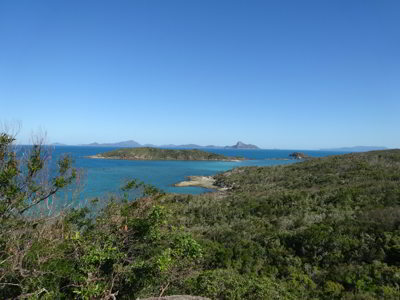 Once back on Catlypso we have lunch and at 1300 we leave and motor to Whitehaven Beach. We anchor there at 1405. There are heaps of boats here today, more tourist boats than we have seen before. Michael takes Ron and Donna to the beach and they walk to the lookout which has great views to the south. After a swim, they come back to the boat. Michael got confirmation from Ian that if need be, he can purchase and bring up a new chart plotter when he meets us in Townsville on 11 August. In the meantime, we are using our laptop at the helm to navigate. Later we all went to the beach to the north of where we are anchored and walked along showing Ron and Donna the damage from the cyclone. Back on board we have showers, sundowners and then have pork ribs and fired rice. We listened to Souths play Canberra but again they are disappointing and get killed. We decided yesterday that today we would go to Long Island rather than our previous plan of Nara Inlet or Cid Harbour. It was calm last night till about 0300 when we small swell started coming into the anchorage. It was not bad, but we rolled a bit all the way till we left. We get up at 0710 and after breakfast, we leave at 0830. It is again sunny, but later becomes overcast and then, about 1300, sunny again. 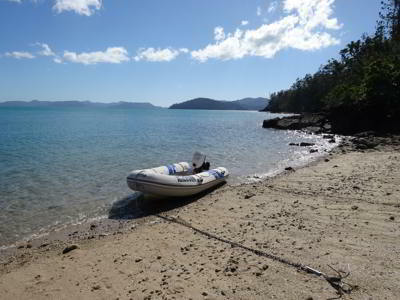 We motor through Solway Passage and once headed for Hamilton Island, we motorsail using the screecher. We make about 5.2 to 5.5 knots into a 0.5 knot current with 10 knots of following wind. 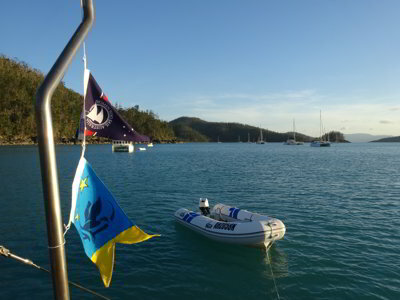 We pull the sail in at Fitzalan Passage and motor through to Whitsunday Passage (via Dent/Henning Islands). We again motorsail but after a short while we turn off the engine and sail the rest of the way to Long Island. We have the calmest crossing of the passage ever! We anchor at Happy Bay off the closed resort at 1200. 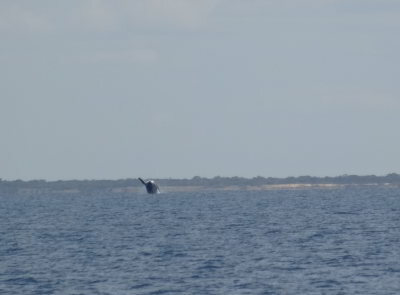 We saw quite a few humpback whales today, some very close to the boat, even right off the tip of Long Island. After lunch, Michael adds 22 litres of diesel to the main tank so we now have three empty containers to fill tomorrow. Michael later takes Ron and Donna south to the Palm Bay Resort. They go ashore and have a look around, it is quite nice. 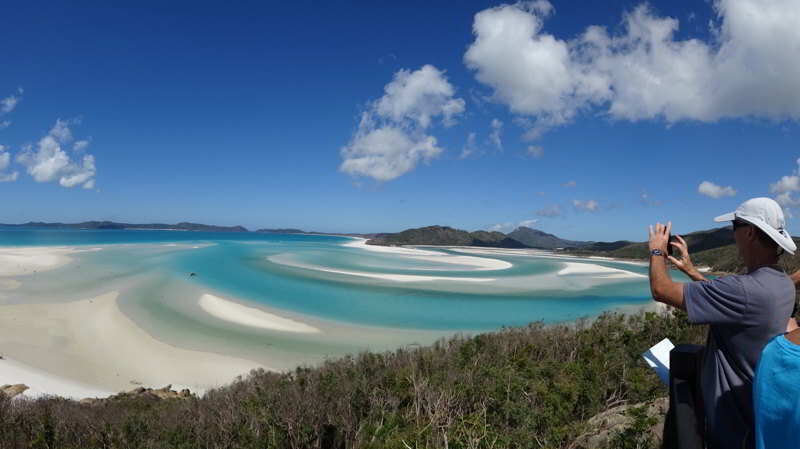 This is the only resort operating on the Whitsunday Islands apart from those on Hamilton Island. After this we go to the Happy Bay beach and Michael goes back to Catlypso and collects Kelly. We have a walk on the beach and look at the abandoned resort. When we get back to the boat, the bloke on the catamaran behind us calls out to Michael and Kelly by name. The boat is called Sea Breeze but we do not think we have ever seen it before. He calls us over, so we motor there. This boat is owned by David and Nerida Lee. Turns out we have never met, but David emailed me back in April 2015 about AIS and some other things. We have a nice chat and hope to be able to catch up with them properly later. Before we pull the dinghy up on to the davits, Michael adds 10 litres of fuel so we have more empty containers to fill tomorrow. We have showers and sundowners. Dinner is masaman beef curry and rice. It is very calm this even, with little wind and very flat water. It was extremely calm overnight and sunny again this morning. After breakfast we head off at 0845, motorsailing up Molle Passage. We are doing about 4.8 knots with a slight current with us in 13 knots of wind and one engine at 2000 rpm. 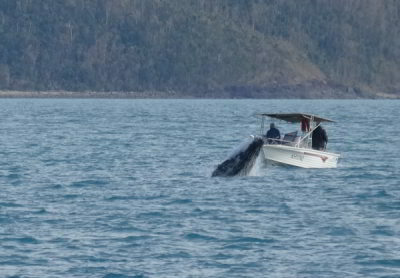 As we near Daydream Island, we see a very small baby humpback whale continually breaching. It goes so close to a small anchored tinny they must have had an amazing, if somewhat scary view. 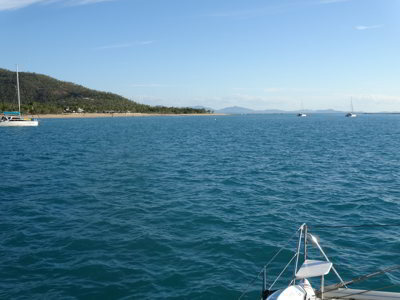 We motorsail nearly all the way to Airlie Beach and then motor to Cannonvale where we anchor at 1120. As soon as we are anchored, Michael takes Ron and Kelly to the boat ramp. Ron catches a bus towards Shute Harbour to collect his Prado from the caravan park where he left it. Kelly walks to the Cannonvale shopping centre to do some laundry and buy some food. Michael goes back and loads up Thunderbird 2 with fuel containers and Ron and Donna's things. When Ron rings that he is leaving the caravan park, Michael takes Donna and Veto to the boat ramp. Here they load the fuel containers into Ron's car and he takes Michael to the fuel station at the shops. Michael fills the three diesel containers and three small petrol containers (and exchange a gas cylinder) and they collect the food shopping off Kelly. Back at the wharf, these are loaded into T2 and then Ron and Donna leave to go back to the caravan park. Michael takes the fuel and food back to Catlypso and puts most things away. Later Kelly phones that she is on her way back with the laundry so Michael goes back and collects her. We have pies for lunch at the ramp. Luckily Michael notices that Donna has left their fishing rods there, so he collects them. After this, we head to the Abell Point marina in T2 to look for a chart plotter. 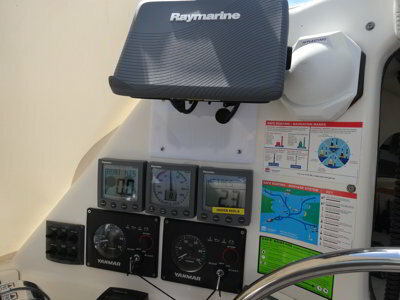 We try both the electronic shops but neither has the Raymarine A95 in stock and the price they quote is $1999. 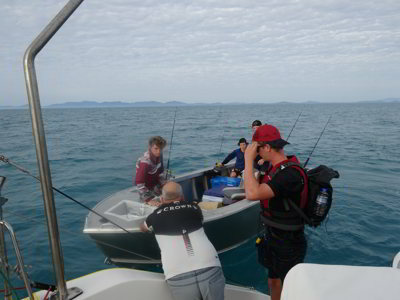 We know we can get it for $1699 from Whitworths, so we decide to go back to the boat and see what we can do. Kelly phones Whitworths on-line ordering place in Queensland and the bloke that answers says that the A95 is now discontinued, replaced by the Axiom. He says the only ones they have are in the Caringbah and Brookvale shops. Kelly rings Caringbah and they do have, but it was ordered in for someone who has not yet collected it. They say they will phone him and see if he still wants it. They ring back a few minutes later saying we can have it. Kelly pays for it ($1699) and says someone will collect it for us. Michael phones a couple of friends who live nearby, one is out but Eddie answers. Yes, he can collect it this afternoon and also mail it to us at the Cannonvale Post Shop. He does this, the postage is about $58. Meanwhile, Michael orders an update of our charts from the Navionics web site. This is a very poor site, so we hope we can upgrade from the old compact flash card to a micro SD card. This will be delivered to the Abell Point Marina as we could not ascertain if it will be Australia Post or a courier company delivering. This cost $197 including freight. Later we take Veto to the beach for a run. We then have showers and go in T2 to the ramp and then walk to Banjos at Cannonvale. This is where we went last Sunday for dinner with Steve, Sue, Ron and Donna. We are meeting Ron and Donna there for dinner. Tonight is chicken parmigiana night ($16), so we have these again, excellent. We get back to the yacht at 2100. It is calm now, earlier it was quite windy. It was calm last night and again this morning is sunny. We get up at 0800, our latest for weeks. Michael takes Veto to the beach and on the way back drops in to say hello to Geoff on Highland Dancer, another Lightwave 38. Michael met Geoff in June 2014 at The Boatworks when he was preparing Pieces of Eight (as Catlypso was then called) for her journey south to her new home. After we have breakfast we head off to go to Bunnings. This is about a 25 minute walk from the boat ramp. Once there we purchase some things so we can install the new chart plotter. The old one was flush-mounted (that is fixed into the boat itself) but as the new one is larger (9 inches v 7 inches), it will not fit like that and we do not have the tools to do it anyway. We purchase a piece of perspex to cover the hole. We also buy some hacksaw blades to cut it to size, some larger drill bits to cut the right size hole for the power/data cable to come through the perspex. We also get a couple of other things we need. Ron phones us a couple of times, they have found us a replacement tea pot and coffee plunger to replace our broken ones. He later drops this at the ramp where Michael meets him. After lunch, Michael cuts the perspex to size and installs it over the large hole. 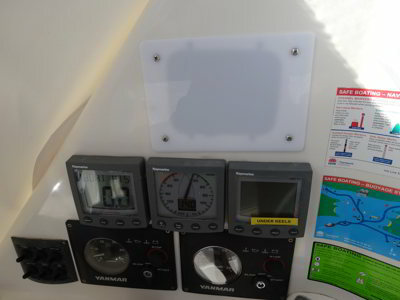 Once the chart plotter is installed using its mount, this really should not be all that visible. Next job is to install the genoa sheet locker for the port sheet. Then we remove some broken and failing clips for the window shades and other clears/covers. We have a few more to do which we will probably do tomorrow. In the afternoon we hear a helicopter approaching from up the valley to the south-west of us. 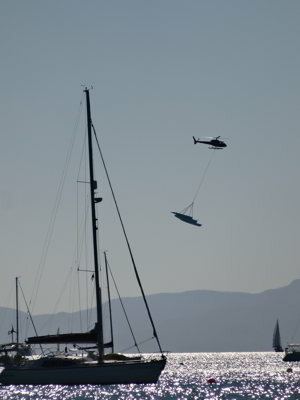 As this is an usual place for it to be coming from, we have a look and see a Eurocopter A350 Squirrel with a yacht hanging on a sling under it. 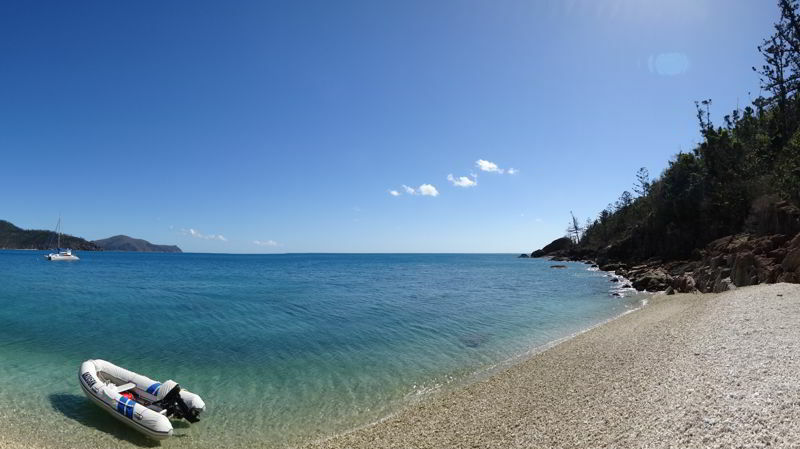 It flies over the water to Airlie Beach. We later find out that the owner transported it this way to Airlie Beach as it was easier than getting approval to road transport it and the cost was similar! He needed it there for the upcoming Airlie sailing week. We later take Veto to the beach for a run. After this we have sundowners without grog, we are going to have a couple of dry days! Dinner is lamb rissoles and salad. Michael updates this blog and then we go to bed at 2115. A full day! It was very calm again overnight and once more it is sunny when we get up at 0815. We have breakfast and then at 0920 we motor into the ramp and then walk to the canvas repair bloke (Fogerty) out at Cannonvale. This is past Bunnings. It takes us about 30 minutes to walk there. We are getting them to restitch the zippers on our rear rain protection and also make us a new barbecue cover. Our old one has fallen apart dramatically since we started this trip. We then went to St Vincent’s de Paul and purchased some port glasses and also a book. It was 90 minutes by the time we got back to the boat ramp. After this we went to the public wharf in the marina and then to the chandlery. On the way back we dropped into Highland Dancer for a while. By now it was lunch time. After this we removed the Sikaflex from the rear steps as well as on the outside of the port stern section. We put this in back in 2015 but it has not lasted. It was Sikaflex 291 and we are replacing it with Sikaflex 295 UV. We also replaced a few more clips on the window covers. 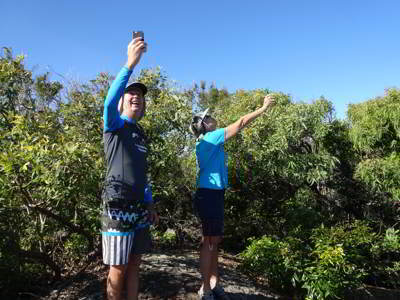 We then took Veto to the beach and also to assist Three Little Birds which is a catamaran from Kiama. They had beached it on Shingleys Beach this morning to replace a thru-hull which was leaking very badly. We ended up using Thunderbird 2 to keep her straight as she backed off the beach. When we got back to Catlypso, as Michael was pulling T2 up onto the davits, something broke and she fell back into the water. 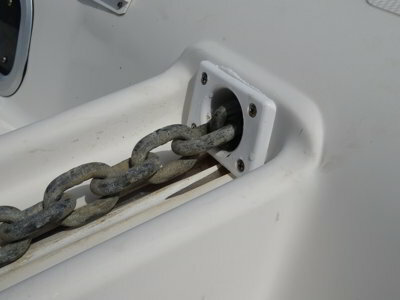 Turns out the U-bolt on the stern rope had come loose and it straightened out. We found another one in our spares and all was good, this time Locktite was used to stop it undoing (we later found the old one and fixed it). We had creamy ravioli for dinner. It started raining about 2030 but although it was heavy, it did not last too long. At least the boat got a bit of a wash. There was no more rain over night and again it was very calm. We got up at 0800 and after taking Veto to the beach, we had breakfast. 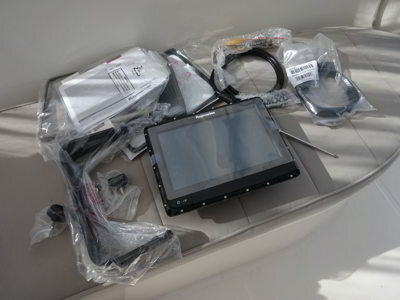 Michael got an SMS saying the updated Navionics charts had arrived at the marina so he went and got them. When he got back, he attempted to validate the purchase but could not as the USB device provided to enable a laptop to read the old and new cards could only read SD and Micro SD cards. The old charts were, of course, on a Compact Flash card, very old technology. 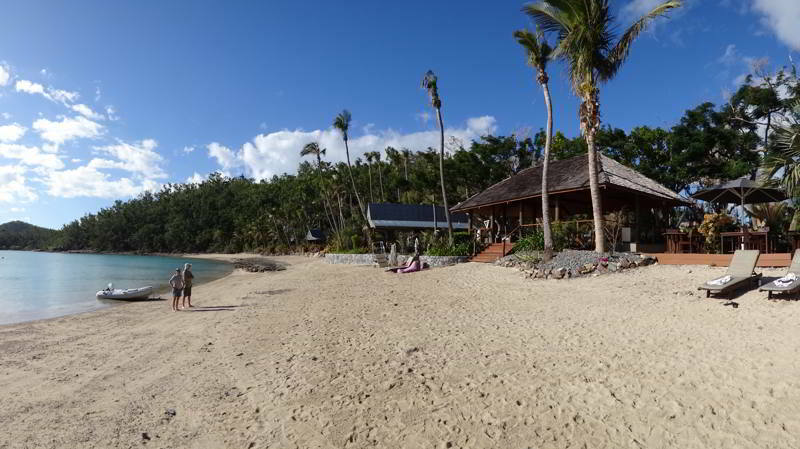 Kelly put a post on Women Who Sail Australia Facebook page asking if anyone in the Airlie Beach area had an external card reader. She got a reply from Verena, the owner of Whitsunday Dive Adventures, who said she was on the way to the ramp with the reader. Wow!! We went and met her and she gave us the reader to use. Back on the boat, Michael used the reader and successfully validated the update of the charts. He also updated the charts to the latest ones. We then did some more work on the rear Sikaflex, removing more from the stern and the starboard side. After lunch, we went and got the Shag Island Cruising Yacht Club car from the chandlery ($10 donation and $5 fuel) and drove out to collect the repaired rain shade and the new barbecue cover (looks great). We dropped by the post office to see if the new chart plotter was there, but it was not. After we got back we decided we had to get the reader back to Verena. She had not answered a message till now, so we did not know where to return it. Kelly ended up catching a bus out to the dive shop which was near where we drove earlier. We are certainly grateful to her for this assistance. While she was away, Michael ran the port engine to heat water as we have not had a shower for three days and we want to go out for dinner. After he collects Kelly at the ramp, we have showers and then go into the public wharf again and walk to Sorrentos. We again have pizzas and some nice beers. Veto comes with us and sits in the garden next to our table. We are back on the boat by 2000 and in bed not too long afterwards. It was a very calm night. We got up at 0730 and at 0835 after breakfast we went to the shore and then walked to the shops and the post office. Yes, the new chart plotter was there, even though the Australia Post tracking web site still had it sitting in a suburb of Brisbane. Kelly then did some final shopping. When we got back on board, Kelly put all the things away while Michael started installing the chart plotter. It was a fairly simple thing to do, but a lot of fiddly work. 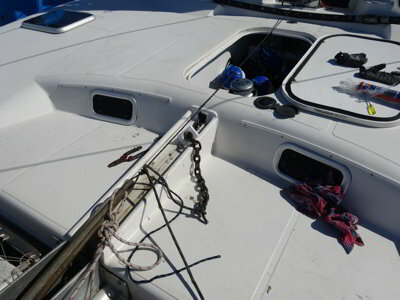 He had to drill new holes for the support bracket and then rewire the power and the NMEA connections to the AIS and autopilot. Once the new chart card was installed, it all booted up correctly and everything worked. We still need to do a couple of things to make it look okay, but that can wait. We left at 1210 and motored into the marina to use the public wharf. We intended to fill up our water tanks here, but there were two yachts on the wharf and another one waiting. One of those on the wharf had been there since last night, so that is a bit annoying. We turned around and headed back out, making way for Gloucester Passage. We can use the watermaker to top up the tanks. In any case, we only needed enough water for about a week as we have to go into the marina at Townsville next Friday to drop Kelly off to fly back to Sydney. 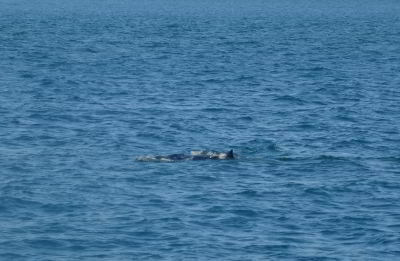 One of the six manta rays we saw in Gloucester Passage Four Lightwaves in one photograph! We motor all the way to Grimston Point and then used the genoa to give us a little more speed. There is only 12 knots at the most of wind, so sailing is not an option. We later change to the screecher and as we come into Gloucester Passage we pull in the sail and motor the rest of the way. In the passage we see at least six manta rays, some only a metre across and others well over two metres. Outside Montes Resort there are three Lightwave 38s, DeLight, Miss Polly and Salacia. We anchor on the western side and south of Shag Island. We take Veto to the beach and then have showers, sundowners and a nice beef fajitas dinner. Michael also watches on his phone South Sydney play St George. Souths get up in the last few minutes, their first win for five weeks! Later Michael created a route for tomorrow’s sail on the laptop. He then copied it onto a Micro SD card and successfully imported it to the chart plotter. 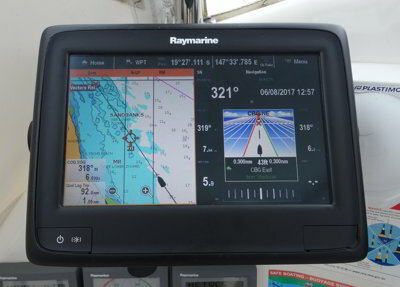 He also downloaded the Raymarine app to his phone which lets you see the chart plotter screen via WiFi, handy if we want to sit on the bow as we are going along. We go to bed at 2100. We get up at 0615 after another very calm night. Michael takes Veto to the beach and notes the very red sunrise. Hopefully he thinks that it does not conform to the old sailors saying “Red sky in the night, sailor’s delight, red sky in the morning, sailor’s warning”. While he is gone, Kelly makes breakfast. After this we prepare to leave, hauling up the main sail at anchor. 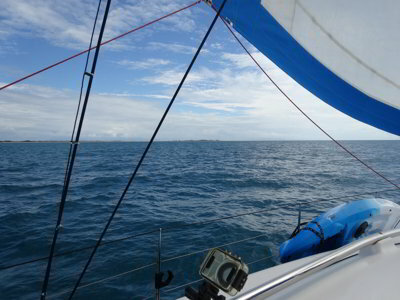 There is little wind, something that will persist through the whole day (less than 4 knots). We leave at 0710 and pull out the screecher once a little more wind blows (8 knots). At 0745 we hear a Mayday. 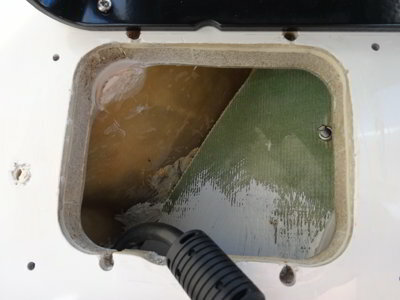 This is from a young bloke on a jet ski which has sunk near Gloucester Passage. At first we do not get involved as another boat has contacted him and he says he can see the boat coming towards him. However, it is soon apparent that the boat he can see is us. He says he is between Shag Island and Middle Island. This is just to the north of our route. Michael calls him and asks if the boat he can see has two sails up. He confirms it has, so as we are the only boat within 10 miles with two sails up, we are now involved. We tell him we have to drop a sail (the screecher) so we can turn towards him. Once we have done this, we turn 90 degrees to starboard and he says we are now heading right at him. 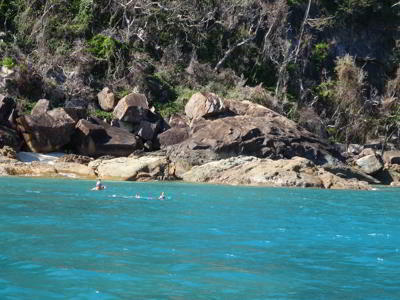 We spot his jet ski, the bow floating about a metre up in the water. 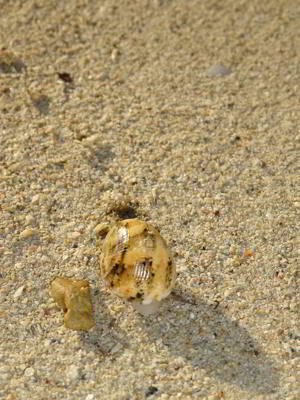 We then see his (tiny) head and he sets off a flare (he had apparently already set one off but we saw nothing at all). Even this one is very hard to see, it was not a smoke flare but one for use at night. Fifteen minutes after hearing the Mayday, we arrive at his location and get him on board. By now another yacht, Heatwave, a trawler style boat Escape and a tinny with three young blokes were also converging on the spot. The tinny arrived first and they confirmed that they were also from Montes Resort where the jet ski came from. We transferred him to their boat and they later took the jet ski under tow. Also involved were VMR Bowen (who initiated action to send out their rescue boat), Hay Point VTS and Montes Resort. Looks like our NSW Marine Rescue training has again come in handy! Looks like the red sunrise this morning was a real omen! By 0815 we are back on track for Cape Upstart. The seas are millpond and the wind is still no more than 11 knots which was only for 30 minutes or so. 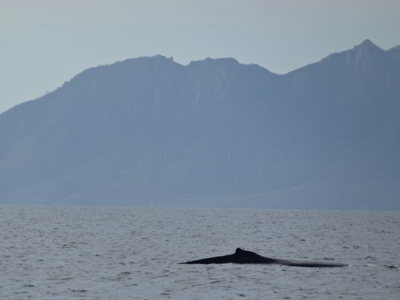 There are plenty of humpback whales about today. We see probably 20, almost half of which are babies, some tiny. They breach out of the water (even the babies) and fin and tail slap. What a sight! We motorsail past the Abbot Point coal loader (boo, hiss). 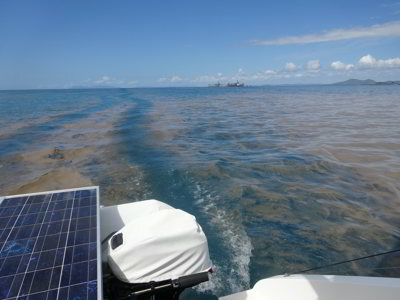 There are about 10 coal ships here and there is a red tide (algae?) for miles before and after the loader. We continue to see whales and then as we round the top of Cape Upstart, we pull in the screecher and later the main sail. We anchor south of the western cardinal mark in about 5 metres of water at 1640. It was calm for most of the night but it rained lightly from 2345 till 0345. After this it was windier and also a bit rolly till 0530 when it calmed down again. At 0710 Michael took Veto to the beach and then we had breakfast. At 0755 we left and motorsailed towards Cape Bowling Green. The wind today is predicted to be fairly light and we only have about 8 to 12 knots all day. We have one engine on the whole time and we sit on about 5.4 to 5.7 knots with a 0.5 to 1.0 knot current against us. There is a slight slop from the east, so it is not all that comfortable, obviously the wind from early this morning has stirred it up a bit. 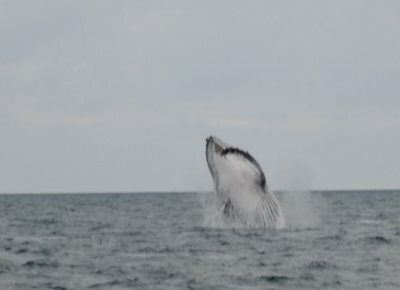 We see heaps of whales again, including a mother and baby breaching in synchronisation less than 200 metres from us. We have an uneventful sail and pull in the screecher as we round the western end of the sand spit at Cape Bowling Green. 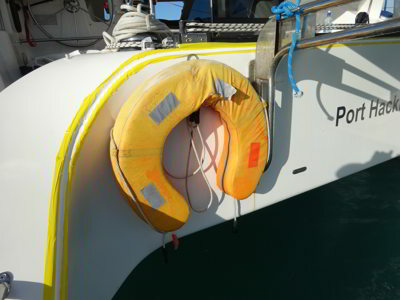 We motor around and anchor at 1500 in 2.0 metres right on low tide. We are just south of the sand spit. It is very calm here. The wind is still only 10 knots. Once anchored, Michael tops up the fuel tank with 66 litres of diesel from containers. At 1630 we go to the beach and have a good walk, including over to the ocean side. There are two other catamarans here tonight. Michael makes a template for the new Perspex he has to cut to cover the hole left by the old chart plotter. He will cut this out tomorrow and install. He also removes the tape from the Sikaflex repairs. We have showers, sundowners and then a nice dinner of beef fajitas. It later rains some more. 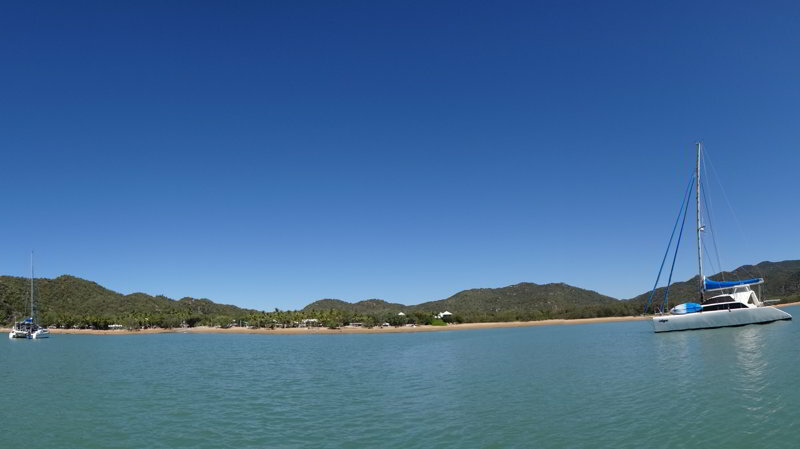 We have decided to stay here for today as the wind is forecast to be so light that we would have to motor the whole way to Magnetic Island, with virtually no wind assistance at all. It rained almost the whole night on and off, but it was very light. We get up at 0800 and Michael takes Veto to the beach. It rains again while he does this! We have breakfast and it starts to clear a bit. Michael buys some more data for our SIM card which we use in the wireless router on the boat. We have been using our phone data since we started this trip, but downloading manuals and information about our new chart plotter has almost exhausted our limit and we still have half a month to go. We use Telstra (as does nearly every cruiser due to its far superior coverage) and we get 15 Gb for $140 which is valid for 104 weeks. The data is expensive, but we will only use it when we run low on our phones. It is cheaper than if we go over our phones’ limits (which we share between us). Kelly prepares the anchor so we can replace the anchor hawser. This is broken from the chain running in and out. It is actually a fishing rod holder, so Kelly bought one and has cut it to fit. Before doing this, she shortened the mooring line on our dinghy so we would not run it over. 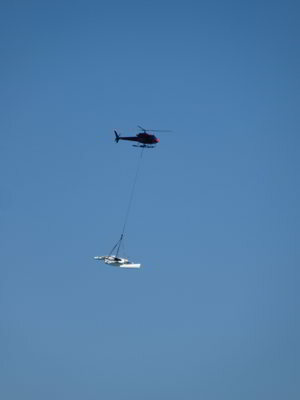 However, it seems that the rope broke as when she comes back from the bow, she sees Thunderbird 2 floating away. By now it is about 400 metres away. We get one of the kayaks off the bow and Michael paddles after T2. He catches it fairly quickly as the wind is very light. That was lucky! Once we have the kayak back in place, we pull up the anchor and as Michael slowly motors around, she ties the anchor off and removes the chain from the anchor. This enables her to slip the rod holder over the chain and into place. She Sikaflexes the holder and screw holes and screws it back in place. She then reattaches the chain to the anchor and puts on some cable ties to make sure the U-bolt does not undo. We then re-anchor, a bit further in and closer to the beach. By now it is sunny and 28⁰C. 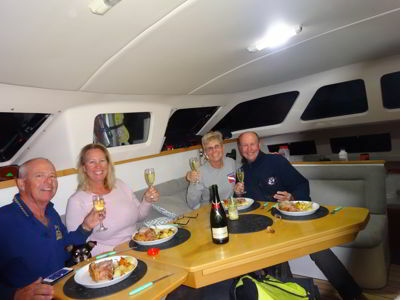 Kelly makes a new mooring line for T2 and then cooks jambalaya for dinner. After lunch we went for a run in T2 to the south-east, but it was too shallow to get close to the beach. We went back nearer to where we are anchored. We walked along the beach for a bit and also had a swim and sunbake. 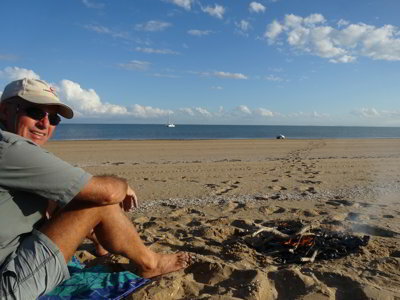 At 1630 we went back to the beach again for sundowners. We light a fire and burn some of our cardboard and paper and also some of the timber washed up on the beach. We watch as more than a dozen fires start and end to the south of us, sugar cane being burnt off. Each of these fires creates its own cloud, spectacular. The sunset is also very nice as is the full moon rising. We head back to the boat at 1805. 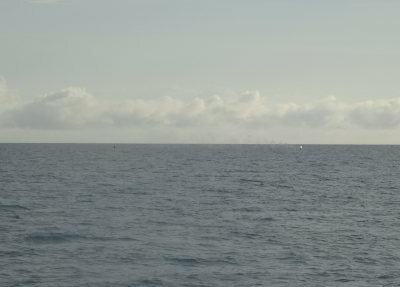 As we get back on board, we hear the Reef VTS calling all ships in the vicinity of Hinchinbrook Island. It seems that a boat has set off an EPIRB. They get no response, despite trying a few times. We later hear Rescue 521, the Townsville based rescue helicopter, call a boat. However, we only hear it call once and we hear no apparent response. We never hear what happened. We have showers and then the great dinner of jambalaya. Another catamaran comes in at 2100 and anchors to the west of us. 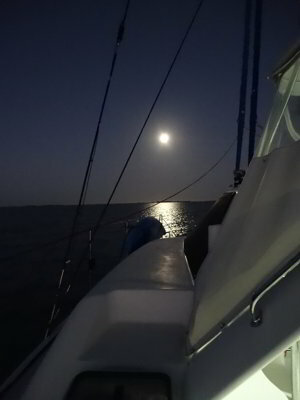 It is a spectacular evening with the full moon and the extremely flat seas. We go to bed at 2130. It was very calm till 0400 when the predicted southerly hit. The wind went up to about 16 knots and the seas got a bit sloppy as there is little protection from purely southerly winds at this spot. However, it is not too bad. It is also very foggy. We get up at 0620 and the fog has by now mostly blown north out to sea. It is too rough to take Veto to the beach, so we have breakfast and leave at 0700. As soon as we are clear of the sand spit, we pull out the screecher and turn off the engines. We sail in 15 to 20 knots (and some 25 knot gusts) at 6 to 7 knots with a 0.5 knot current against us. The wind was supposed to be only 10 to 15 knots! It is a bit sloppy with the beam on swell and wind, but it is not too bad. One thing we have noticed with the new chart plotter, the autopilot is working much better. We assume that this is because it is responding quicker to changes in direction, enabling the autopilot to modify its settings. Whereas before we needed to constantly alter course, we find that we hardly need to change the course at all. Fantastic! We see lots more whales today, again more breaching of young and old. 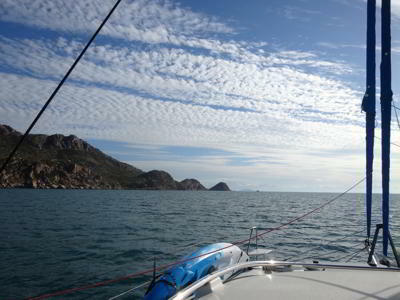 As we near Cape Cleveland, the wind drops to about 10 knots and goes more to the west. We have to put on an engine as our speed goes down to under 4 knots. 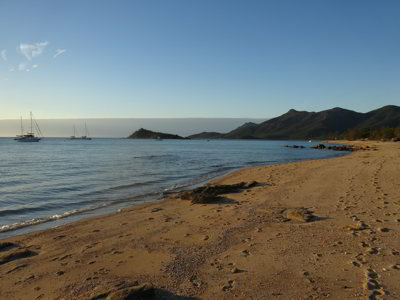 We motorsail the rest of the way to Magnetic Island. It is much calmer for this section of the trip. On the way Michael is phoned by a lady from Marine Services Queensland who are investigating the incident involving the jetski at Gloucester Passage on Saturday. 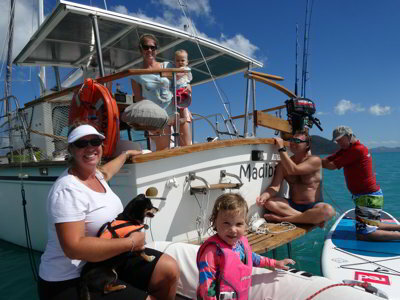 She got the name of our boat from VTS Whitsunday and our details from this web site. Michael goes through with her what happened. It seems that no one knows the name of the bloke or his registration details. We pull in the sail as we enter Horseshoe Bay on the northern side of Magnetic. We motor in and anchor near where we did two years ago, close to the beach. Geoff and Marina from Island Home come over before we have even finished anchoring and we arrange to have drinks later. Michael takes Veto to the beach and Kelly makes lunch. 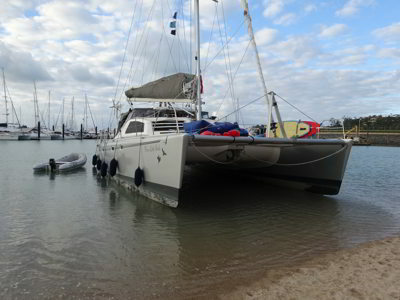 After this Kelly books us into the Breakwater Marina in Townsville for next Saturday. This is when Kelly has to fly back to Sydney and also Ian returns for a week. We later go to the beach and spend an hour walking along it. After we return, we head over to Island Home and stay there for almost two hours. We return to Catlypso at 1835 and Kelly cooks pork ribs and Michael makes fried rice. We then have very late showers.